I do not remember life before mason jar salads. Seriously, I make 5-10 every week for our lunches and can’t imagine trying to eat healthy without them. Mason jar salads make it so easy to fit in a nutritious portion controlled meal every day. Not to mention they are delicious and completely satisfying. I have not posted a new mason jar salad recipe in a while – the last one was my farro and goat cheese salad back in April. I actually have lots of mason jar salad recipe ideas but I never seem to get around to them. My husband and I love the Greek Mason Jar Salad so that’s the one we stick with week after week. Anyway, it has been awhile and I have been craving a little variety with my mason jar salads so I thought it was time for a new recipe. Last week I went out to dinner at the Cheesecake factory with my girlfriend Paula. I won’t tell you want I got because it was soooo unhealthy. Okay, it was the cashew chicken but it wasn’t that good and I barely ate any of it. However, as I was scanning the menu their barbecue ranch chicken salad caught my eye. I thought to myself “hmmm this would make a nice mason jar salad”. So I jotted down the ingredients and bought them the next day when I went to the grocery store. Of course, my goal is to keep these salads healthy so I don’t want to fill them with a ton of fatty dressing. I decided to use Wegmans’s yogurt ranch dressing and Annie’s Homegrown smokey maple barbecue sauce. Both of these ingredients together were AMAZING. Now you can use any ranch dressing or barbcue sauce you want but keep in mind it will change the flavor. That’s not a bad thing but just something to think about. I kept the chicken part easy by using a rotisserie chicken. I mostly use the chicken breasts and save the legs and thighs for my husband to eat. You can always use basic shredded chicken, grilled chicken, or any chicken you have on hand. As with most of my mason jar salad recipes I used cherry tomatoes and baby cucmubers for the dressing barrier. Then I layered avocado, corn, black beans, red onion, and romaine. I squirted the avocado with lemon juice to keep from browning. This seems to work very well for me. I only used 1 tablespoon of beans and corn so you will probably have some leftover. I used the leftovers in tacos but you can freeze them if you want. Last but not least I crushed about 4 tortilla chips and added that to the salad after I mixed and poured it onto the plate. I would not place the chips in with the salad. I think they would lose their crunch that way. Just throw them into a Ziploc snack bag and bring it with you. Please note this salad needs a good shake to get the dressing moving from the bottom of the mason jar. Ranch, because it is thicker, gets a little stubborn sometimes. This Barbecue Ranch Chicken Mason Jar Salad is scrumptious! 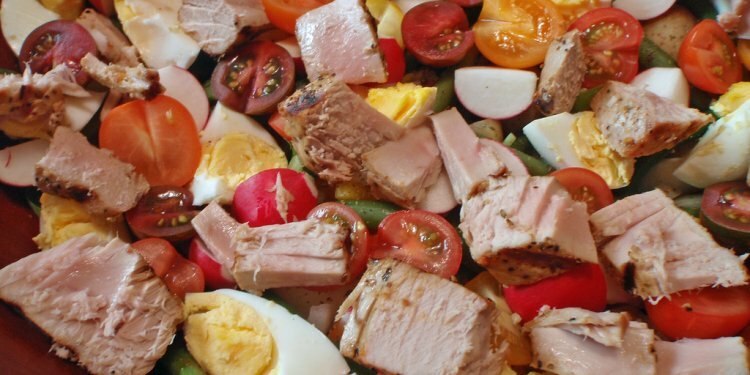 I love the flavors and textures of this salad! For more “how to” information on mason jar salads and additional recipes check out my tutorial. Divide all ingredients among mason jars. Start with ranch dressing and barbecue sauce then layer tomatoes, cucumbers, avocado, beans, corn, onion, chicken and end with romaine. Store in the refrigerator for up to 5-6 days. Pack tortilla chips on the side. When ready to eat shake mason jar and pour onto a plate.